【Versatile Capability】: Slow Juicer can extract the juice from various fruits & vegetables, including ginger, wheatgrass, leafy greens and hard vegetables etc. 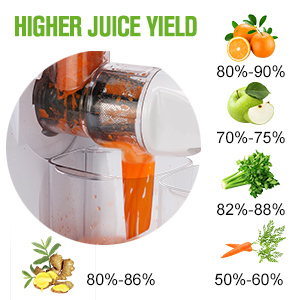 【Higher Nutritional Value】: A low-speed juicing system that rotates at 80 RPM keeps nutrients from being destroyed as opposed to common centrifugal juicers. 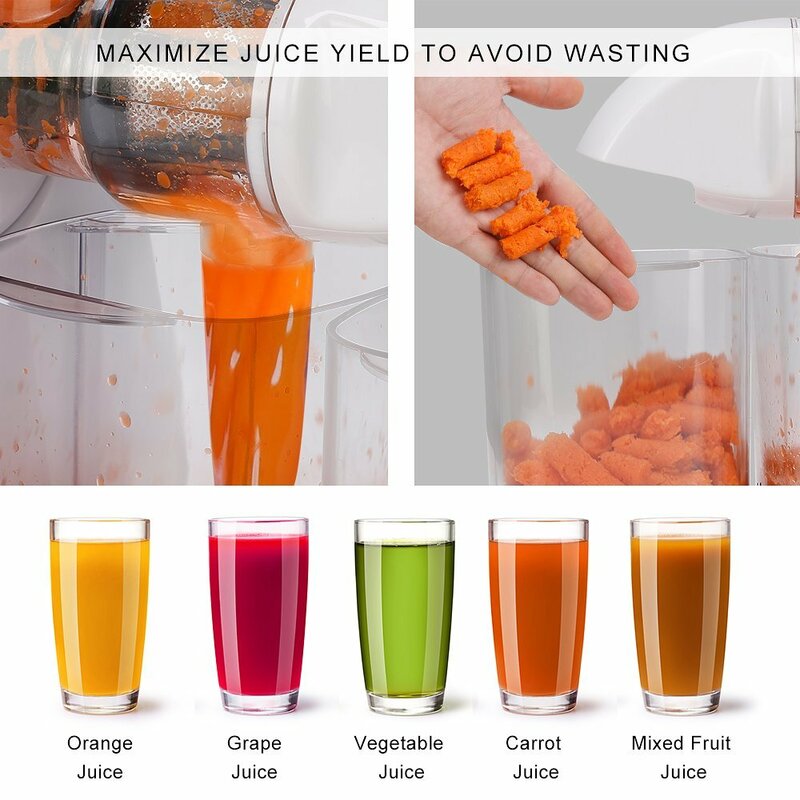 【Maximum Juicer Yield】: This juicer maximizes the juice yield with up to 80% extraction, meaning more nutrients get released from the fruits and vegetables. 【Quick and Quiet】: Easy to assemble, operate, and clean. 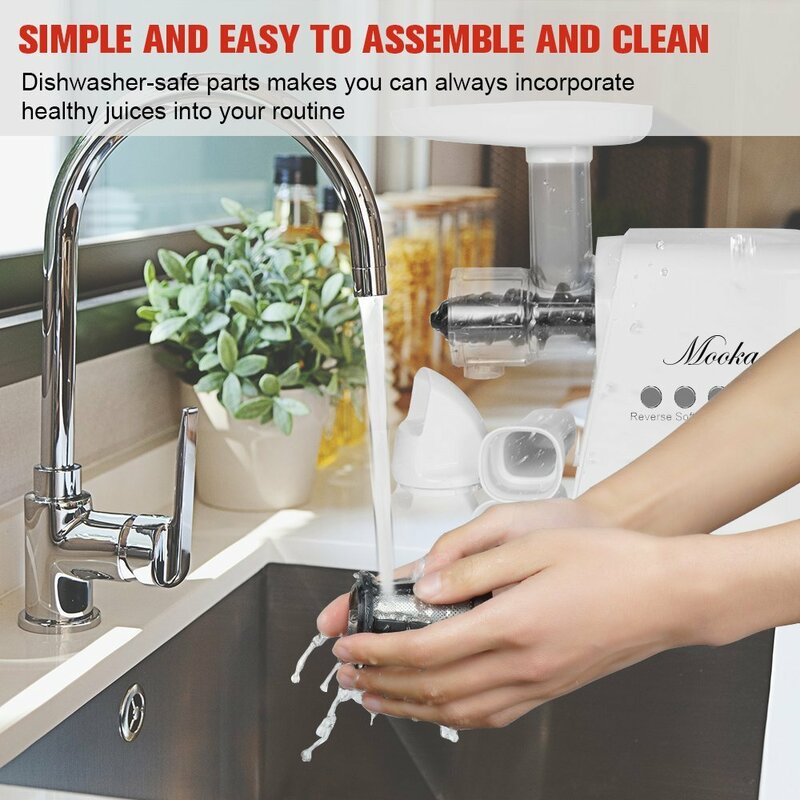 All detachable parts are BPA-free and can be safely cleaned in your dishwasher, whilst the motor noise is less than 60 db. 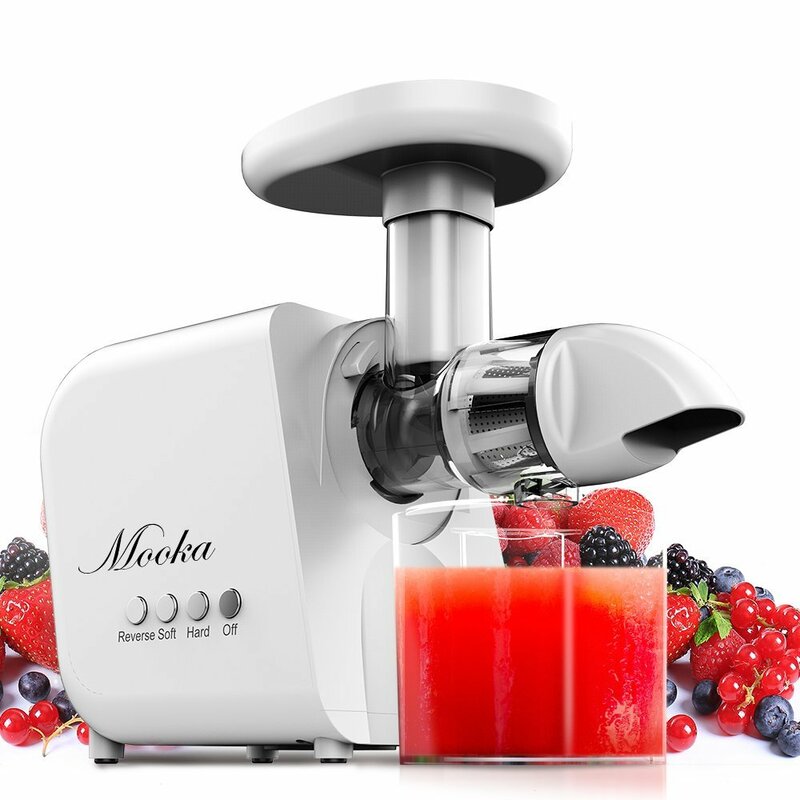 【Warranty & Service】: The Mooka slow juicer is implemented with the latest technology and has achieved UL, ETL and FDA certification. We provide lifelong technical support and customer service. Our motor is covered by a 10 years warranty. The remaining parts are covered by a 3 years warranty. 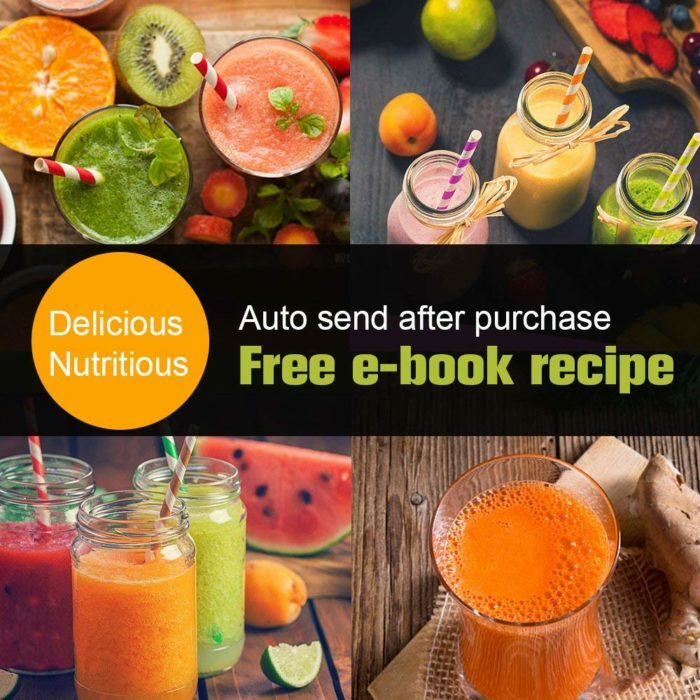 A free recipe e-book is sent you upon purchase. You can also follow a recipe from the included booklet, or be creative and make your own flavor combinations. The Mooka Slow Juicer is Ideal for Your Kitchen. 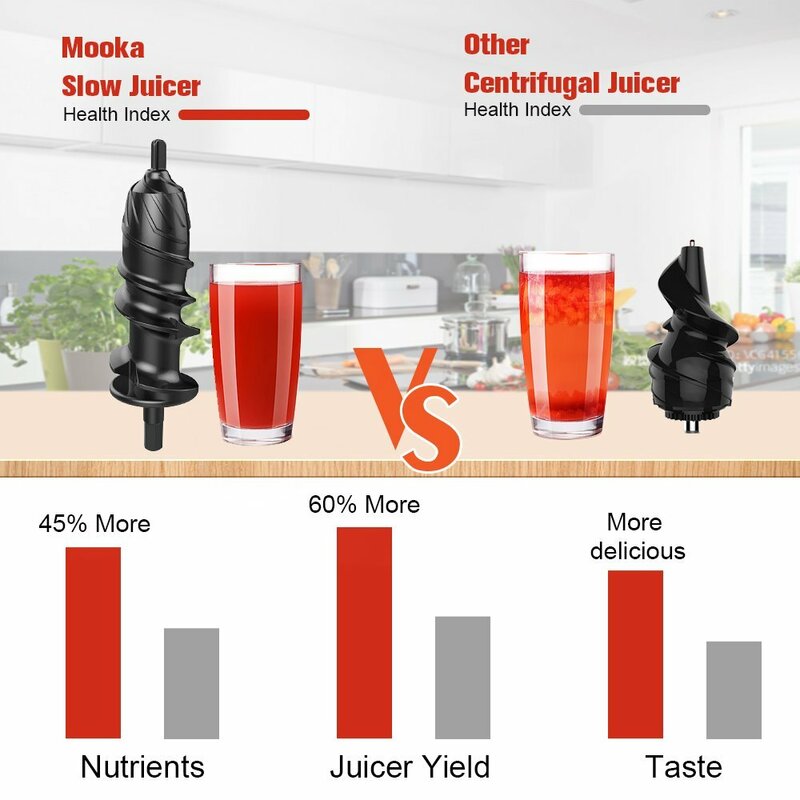 Your Family Can Benefit So Much More With A Mooka Slow Juicer! Slow masticating can perfectly separate juice and pulp, extracting the maximum amount of juice and preserving higher nutritional value. Slow juicer is higher juice yield more than 60-80% compared to centrifugal juicers by the durable auger crushing and squeezing. MOOKA slow juicer creates high-quality fruit or vegetable juices that are free of additives based on a method that minimizes oxygen and heat exposure, resulting in minimal heat buildup and oxidation promoting healthy enzymes. Our slow juicer rotates at a speed of 80 RPM which preserves vitamins, enzymes, minerals, trace minerals and nutrients from being destroyed as opposed to centrifugal juicers. 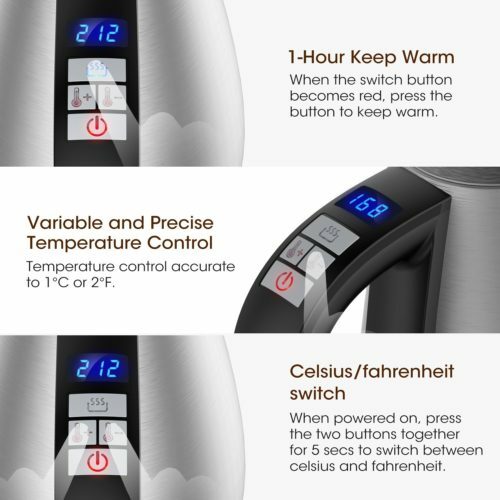 It keeps oxidation to a minimum, low heat build-up, less foaming and no clogging! 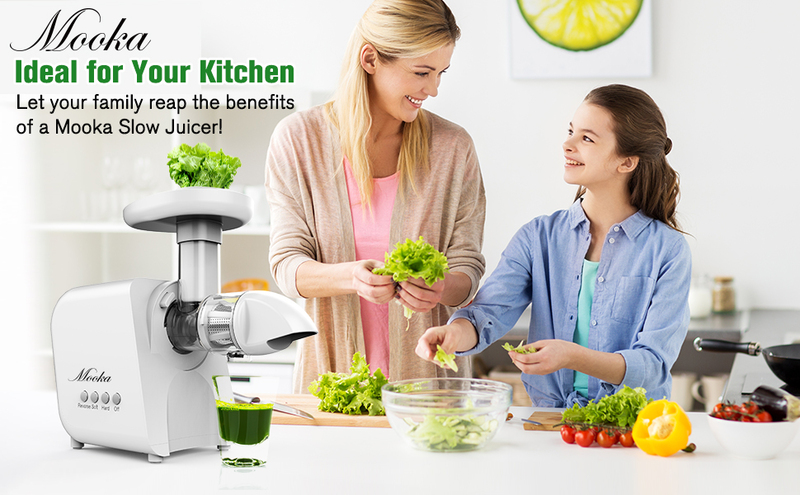 The soft and hard juicing choice ensure our slow juicer can juice everything from fruits and vegetables to leafy greens and wheatgrass. You can control the direction in normal/reverse motion to prevent clogging. Turning it in a reverse direction to remove what is caught inside. 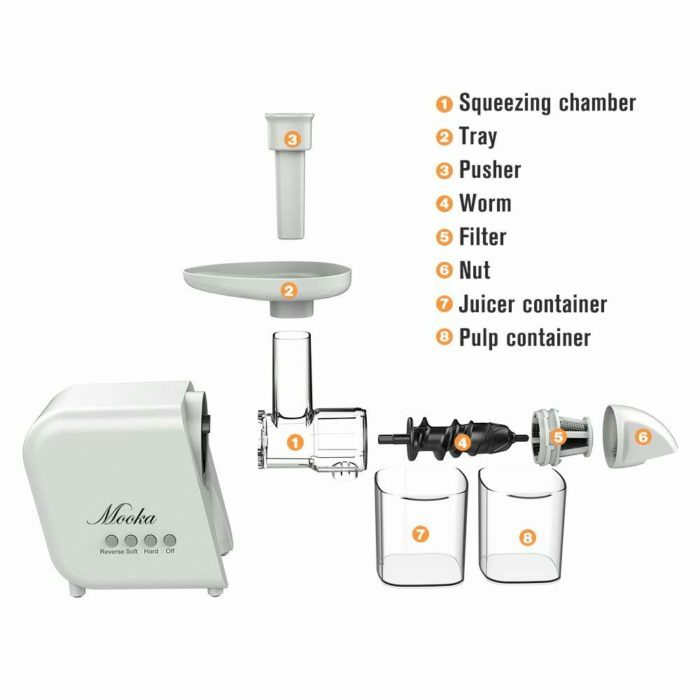 The Mooka slow juicer features a chamber assembly for compressing the ingredients, consisting of an auger, juice strainer, and spinning brush, and an AC motor assembly, which generates minimal noise. The two compartments are detachable, making it easy to disassemble and reassemble the machine. Try to Juice by Yourself Everyday! I am happy that I can finally juice leafy greens but I’m not a fan of pulp. Had to strain off a lot of pulp in the juice. Just quality product. Willing to pay more for products like this. Very presentable and top of the line. Quality and easy to use. I began juicing 5 years ago as part of alternative treatment. Juicing is a great way to give your body nutrients that it doesn’t have to work hard to digest. My last juicer was a centrifugal, and I used it for 5 years before it gave out. 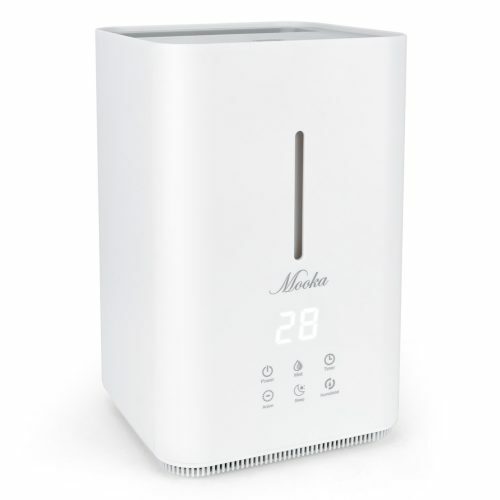 I wanted to upgrade to a masticating juicer because they don’t cause oxidation, and selected the Mooka juicer after reviewing others in this price range. It runs quietly, and is easy to assemble, disassemble and clean. In fact I feel it’s easier to clean than my centrifugal was. You may get more juice extraction from the higher end and more costly masticating juicers, but for people on a budget for whom nutrition is very important, this is a great juicer. Love this juicer it really produces a lot of juice. The only flaw is it doesn’t like kale. GOOD juicer .I am able to juice out from any vegetable and fruits including leafy greens. Only thing is that I have to cut small pieces of any fruit or veggie for better result. Other than that its a good juicer. Great little juicer for the money. Once I disassembled and reassembled the parts it became obvious how easy it was to use. I would have liked better instructions, like: press the release button to remove the drum. I had my husband try to force it out as I didn’t realize that a button had to be pushed in before the drum would come out. SILLY Me, but that step would have been extremely helpful. It also would have been useful to know that the auger had to be seated deeper than just inserting it into the hole. Made it impossible to install the end cap until I figured that one out!!!! With all of that said the machine performs beautifully. Makes great juice and clean up is a breeze. Just one more problem with the instructions. No where that I can find, does it mention that there is a delay in moving from one mode to another. I almost packed it up and shipped it back as I didn’t think the reverse button was working. I had pressed the OFF button and then the Reverse and it did not work. After a short delay I pressed the Reverse button again and it worked. I still don’t know if that is the proper sequence, but at least I know that I can move from Hard or Soft to reverse with that sequence. Again, Clearer instructions would be helpful. I would recommend this Juicer to anyone looking for a masticating juicer. The size is great and I use it every other day and make a quart of juice the stays fresh for both days. I used it everyday. Very quite, easy use and clean. Simple as it is! It is a good product. On the first day of using it, I had experienced some issues with a stuck part that I wasn’t able to unscrew it, but that problem is fixed now. I love my carrot/kale juice. You have to use a lot of carrots to fill the juicer cup☺ I use it every day and I like the fact that it’s not noisy. Easy to use and clean, quiet enough. We are daily users! 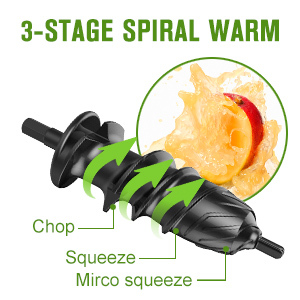 This is the easiest juicer to use and quick clean up too! I have had several juicers in my life but this one is the easiest and quickest clean up ever! It’s very quiet too! I really like the features of hard/soft it helps when I am putting different things through the shoot. The opening on top is a bit small however it’s not a bother to cut things one slice smaller. I would recommend this juicer to anyone. Love this little juicer. It’s just perfect! My juice does taste much better then from my other Brevill juicer which is loud and too fast. You do have to cut the veggies or fruit smaller but this thing is just breeze. I love it.. and for the money.. yeah.. what a deal! Oh and it takes up less space then my other juicer so I’m happy! I bought this product to start juicing, and I couldn’t be more happy! I’ve been using my juicer almost daily since I got it three weeks ago. It works great so far! It is very quiet, easy to use and easy to clean. As others have mentioned, the instructions do not come with any recipes but you can find many recipes online. The instruction booklet must have been written in a different language and translated into English because some of the sentences are odd. Also, the unit comes with something called a shovel but the booklet never tells you what the shovel is for (I still have no idea). I am very happy with my purchase. I bought this juicer because it has a large pulp spout and my old juicer kept getting celery and leafy greens stuck in the pulp spout. This juicer worked really well for a few weeks with regular use, but then the motor made loud noises and stopped working. 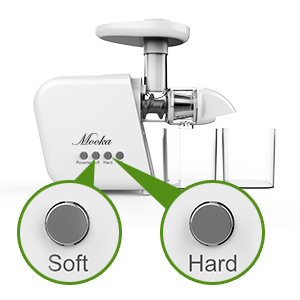 I got on the Mooka website and talked to chat support to file a warranty claim and they fixed the problem for me and sent me a new juicer. I am very pleased with their warranty and customer service. The Amazon description of this item states ” Our motor is covered by a 10 years warranty. 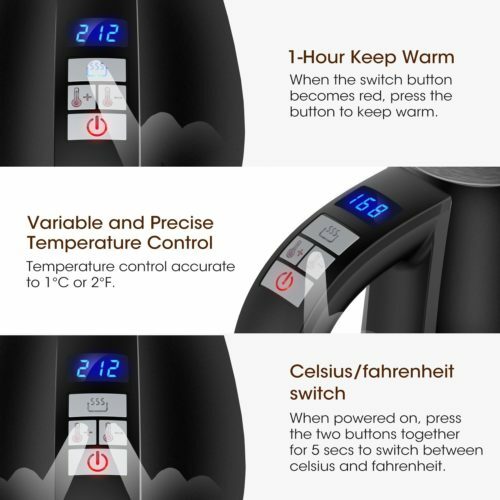 The remaining parts are covered by a 3 years warranty”. This warranty was one of this reasons I purchased this juicer. When I opened the box, the Warranty Card said this product has a one year warranty. I was sent a link to a recipe booklet by the manufacturer that I could download. After I downloaded the booklet, my default search engine was changed Yahoo.com. It leaves me concerned about what else this download loaded of changed on my computer. The juicer arrived yesterday and I used it today for the first time. I juiced the same fruits and veggies I normally juice. The quantity of juice was a little less than I get from my centrifugal juicer and this pulp was wetter then I expected. Updated rating to 5 stars. 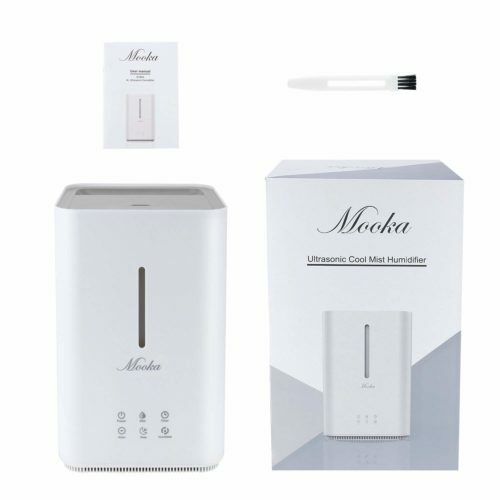 A representative from Mooka contacted me a addressed all my issues. – The warranty card the was sent with the juicer was sent in error, they sent me the corrected warranty card. – I was sent a pdf of the juice recipe booklet. I would still be cautious about downloading the link that was provided for the booklet. – The pulp was wetter than I thought it would be, I run the pulp though the juicer a second time and this second pulp is much dryer. I think this is acceptable for a juicer at this price point. I have been using the juicer daily for a week and am pleased with the machine. I even recommend the juicer to a friend. So far so good for my first juicer. Easy to clean and assemble and de assemble. Wish it extracted more juice from soft fruits like grapes and ripe pears. This is my second slow juicer. I previously purchased a popular one here on Amazon and it didn’t last 5 months. This company contacted me before shipping and even reminded me about their warranty. So far, so good. Creates quality juice quickly and cleanup is easy. The two settings option is nice to have too. So far, so good! I LOVE this slow juicer! I’ve been contemplating on getting one just because the juicer market is very competitive & confusing. My husband actually surprised me & got one for me. I was a little worried cuz it didn’t have many reviews. I normally only purchase products with a substantial amount of reviews but I was surprised with this one! The only reason I knocked one star off is that the spout is pretty small. It isn’t a terrible thing just a nicety. Also, this is really easy to clean especially if you do it right after juicing. Definitely worth the money! Very simple and very easy to use juicer. The taste stays same even after 1 or 2 days in refrigerator. I juice about everything, carrot, apple(with skin), celery, fresh turmeric, ginger, spinach, lemon(peeled), etc… loved it. It’s great! It’s really quiet (I thought these would be louder), and you can see how much it really squeezes out the juice – the fiber that comes out feels dry. I’ve used carrot, apple, kale, lemon – it rocks it all! Super happy with it, and I’m glad I went for the slow masticating type of juicer. Cleanup is also not as bad as I thought. I think it would be a bit of a pain if I did it every day, but I’m fine with juicing a liter or so of juice 2-3 times a week. The juice is still good on day 2 and 3! So far I love this. Its slower to juice and I have to cut up my food more but its so quiet. I love it. Love this product. Easy to use but most important easy to clean!! Love the retro look in my kitchen. I would definitely recommend this product!! I looked for a juicer for over a year, taking time to read reviews and learn the basics. I am so happy to have found the Mooka Masticating Juicer on Amazon. 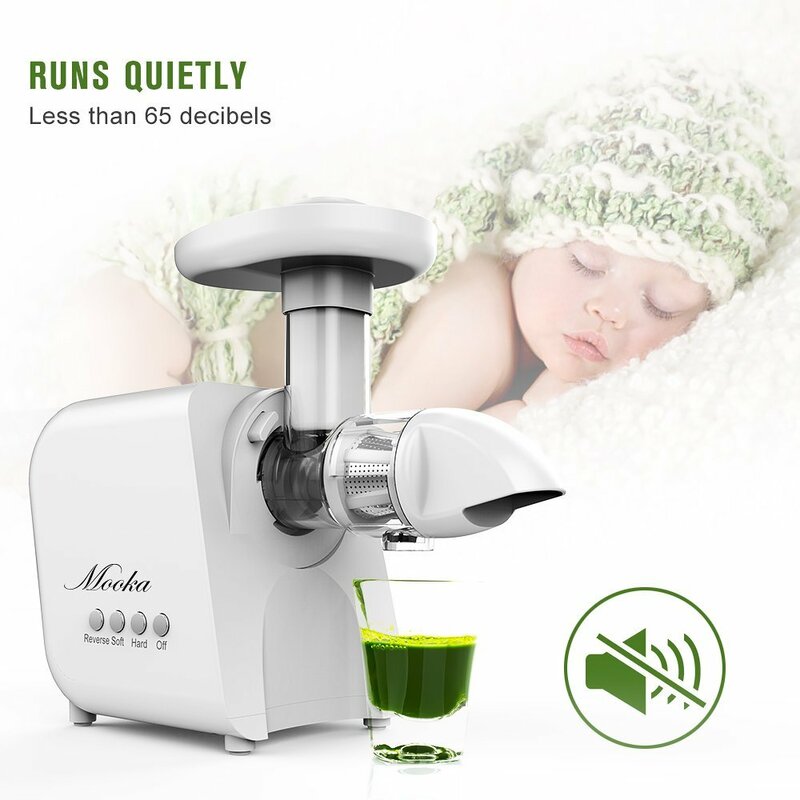 When I first saw it, 6 people had purchased the juicer with a over a 4 star rating. The next time I checked, 9 people purchased and still the same rating. Next was 13 and then 19 purchases with almost a perfect 5 star rating. That has to say something about the quality. This is one of the best purchases I have made. I have had juice every morning since receiving this juicer. I juice everything – carrots, celery, spinach, kale,oranges, lemons, apples, beets and on and on. Consider the rating, price, excellent warranty and customer service and buy it now. I don’t think you will regret it – I certainly don’t. only used it twice but loving ti so far!! This system work with in given specifications. I would like to give 5 star. But will see how this perform as time goes. Successfully juised: watermelon, oranges, carrots, apple, beetroot, red cabbage. Work great and produce most juice as $300 system in Market. Do it slow and cut pices to get good output. Also run the remaing pulp 1 or 2 time to get all juice out. Very easy to clean. Good to have black color. Some issues: grinding rod is getting worn after 15 to20 uses. I just got this yesterday. And I’ve already been juicing like crazy. it’s been a few years since I had a juicer, and it was not a great one. I love how the pulp is pushed out the front and does not cause a giant mess inside the machine. My last juicer basically just made applesauce instead of juicing apples. So far so good. I’ll update this if I need to. This product was easy to use and provide fresh juice you can ever imagine. Good for health . Easy to clean. Comparable to the $$$ juicers without the extra $$! Fantastic juicer for the price! Clean up was very easy and the parts all come off to be washed. There wasn’t anything that I couldn’t put into my juicer. Even my kids love making their own juice. Loving my new juicer. Thanks for making a great product without breaking my bank. Here’s to a happy and much healthier family! This is my first juicer and didn’t want to spend a lot of money. This juicer does exactly what I need it to do. I’ve used it twice now and so far so good! I’m very pleased! I’ve done apple, celery, carrots, cucumber, kale, spinach and beet greens. The machine didn’t hesitate at all when working!! Very cool!! I’ll write a review in a month and tell you all how it’s working!! I like that the juicer is slow enough that the juice is still cold when it’s done and it doesn’t produce very much foam. The juicer seems to do a good job with hard veggies like celery and apples. It’s also easy to clean. The only issue I had is that the auger is hard to get fully seated into the machine, other than that, it’s great! Watch out for stuff that might already used. Love it !!! Shipping it’s not in time and the box is mess up . Everything else is great !!!! I love that it is a slow churn I really feel like I’m getting the most nutrients out of my fruits and veggies. I have very bad stomach problems, to the point that my stomach just always hurts so I turned to juicing to help my stomach heal. I’m still in the process but this juicer is helping me achieve my goal. I wish I could do a 4.5 rating because I love this juicer. The only problem I’ve had is worth the reverse button. It doesn’t seem to be working. I was looking for a juicer that could help me get the most out of the fruits and vegetables I was putting in and this one does it! It’s pretty quiet and very fast. 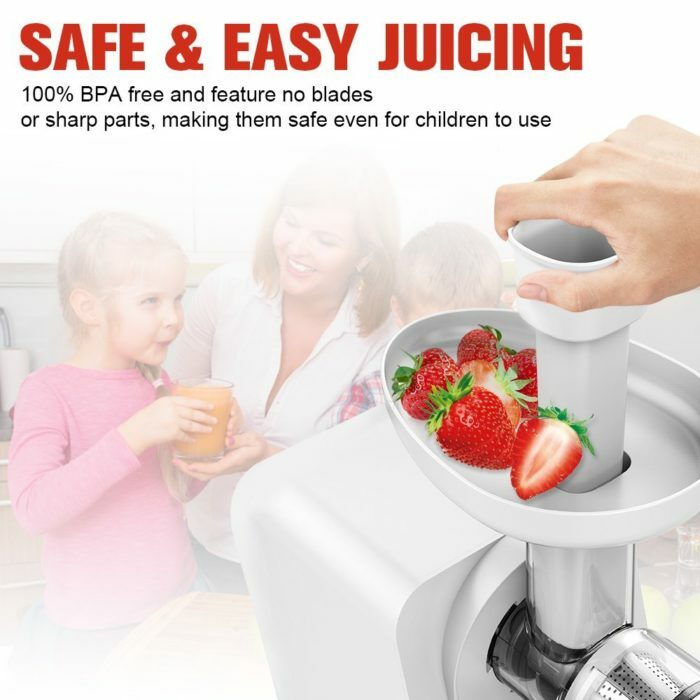 This juicer is easy to use and clean; safe and efficient. A whole new dimension in nutrition. Very easy to use, and cleans up well. Simple to use. Quiet. makes froth-free juice. Beautiful design. Easy to clean. Got product yesterday, put it to a test with a juice that involved carrots, beets, lemons, and apples. Figured I’d try the really hard veges to see how it performs. No issues, it is slow, as all these are and as is stated in the title. But no big deal: this is your health, might as well do it right. I had a Breville but it basically pulverized the veges and I didn’t like the result and it made for awful orange juice. This Mooka did good when I made straight orange juice. Occasionally the soft stuff (like the lemons) seemed to hang up in the auger. Reverse did the trick to get it through. There isn’t really an on/off, if it’s plugged in it is on, no “rest” mode. Hitting the “on” button starts the motor/auger. All in all, very pleased with this purchase and didn’t spend $250+ like some of the other slow juicers here. Plus a one year warranty. Very much recommend. Good price and works great if you really love to make good juice I really recommend this product. Juices the right way! Pulp is dry. Easy to clean, came with a brush. quiet juicer compared to centrifugal, the pulp is dry and the juice is cold. Cleaning is easy and safe, no sharp blades. i think its a good buy. i had difficulty dis assembling after use as the juicer part is already set up in the box but no big deal. Product is good but little bit tricky to clean. But life is easy to make carrot n beet juice. Good heath and great drink! 1) set up about 2 min 2) clean about 2min 3) Great drink with vegetables and fruit on way to best Health. 4) good point with soft and hard machine. All is one best and love it. Thank you dear. Just used juicer for the first few times… Started the medical medium 28 day cleanse. Currently using the juicer for mainly celery juice (mixed with fruits). Compared to my old centrifugal juicer, I am getting a lot more juice with less vegetables and fruits. Although it is slower than the centrifugal juicer, my juice tastes better and holds in the fridge. 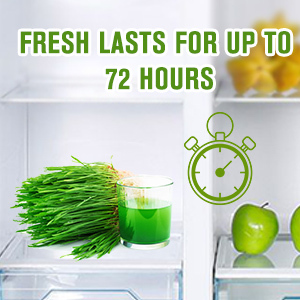 I’ve only let is sit 24 hours in the fridge as I like my juice as fresh as possible. 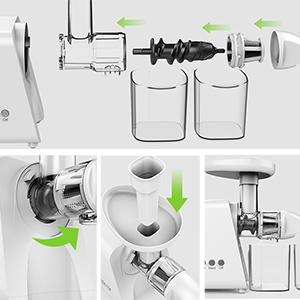 The juicer is super easy to assemble, disassemble, and clean. The brush it comes with is perfect for cleaning the filter. Highly recommend. The juice is all I want , I am happy!! Working good so far. The best thing about this product is how quiet it is. It really is very quiet compared to other juicers I’ve used. I have had the champion juicer as well as the Jack Lalanne. This is the perfect balance between the two because this juicer masticates but you don’t have to wait forever to have juice. It is not as fast as the Lalanne but I can have more greens and veggies, which is thrilling. It is very easy to clean and I love that it has a warranty, which means it is not built to break which seems to be the trend I wish companies would stop doing. Amazing Masticating Juicer – it does a fantastic job, most likely comparable to other similar juicers that could three to four times more. It is quick and easy to clean – pulp is not sprayed all over your kitchen, it comes out slowly in a wormy fashion. So little pulp also, it is truly trying to squeeze out as much juice possible. 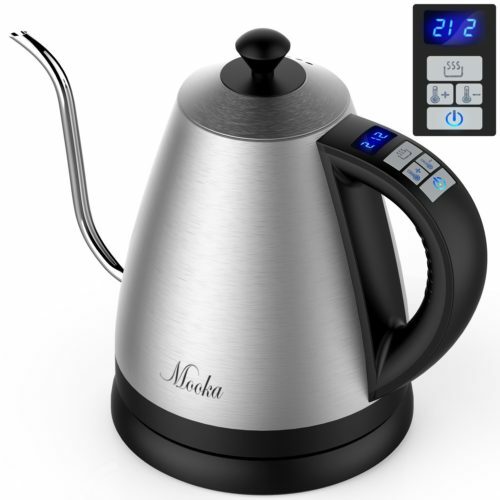 I am extremely happy with my purchase – it is also pretty quiet for a juicer. After using this product for a couple of weeks, I can see the black germs on part 12 blank end cap. The black germs are under the rubber ring, and it is hard to clean. But the representative tried to help me solve this issue nicely. In general, the machine is very useful. I like it, but I wish it would have come with some recipes. I never realized how little juice there is in vegetables. It took awhile to make a cup of juice. However, the wait was worth it. I love how easy it is to use, and the clean up is a breeze. The fruit and vegetables taste amazing. It is somewhat compact so it has been on my counter for easy access. High quality juice and juicer! I am extremely satisfied with this juicer! I’ve never had a slow juicer before. I felt that my previous centrifugal juicer was wasting too much of the produce, along with the fact that the juices started tasting funny after 24 hours. I like being able to make my juices every couple days. I got the new juicer this week, and I am happy with the multiple features for soft and hard foods. I’ve made a mix of juices with the following produce that all worked well: celery, cucumber, lemon, orange with peels on, apples, pineapple, asparagus, carrot (unpeeled). beet, beet greens, and other greens. I’ve found that most of these do really well in this juicer. The juice lasts for up to two days (I haven’t tested it past this point) and it’s still awesome quality. All the produce works pretty well except the beet greens for a little wrapped around the juicer. I used to make straight celery juice with a pound of celery at a time which would make 16 oz of juice. Now, I see half a pound of celery (one normal bunch) makes close to 16 oz, so I’m happy there is more juice, less waste and I can save money on produce! The juicer is easy to clean and to assemble. I am very happy with how well this juicer works. Easy to disassemble and clean. Two speeds. Appears to be well made. Great deal for a masticating juicer of this quality. Great Quality, High Yield, Quiet. Very Impressed! Initially I wasn’t sure what to expect. So often you see pictures and watch videos from reviews and advertisements, only to find the product doesn’t work or perform anything like what you saw when you bought it. But this one was different, a true pleasant surprise. It performs very well! One Red Delicious apple makes enough juice to fill a six-ounce juice glass, as does one navel orange. For those who like their juice with little to no pulp, which is my preference, I was again pleasantly surprised. Set-up of the unit was very easy, although cleaning it afterwards takes just enough time that making only one glass at a time is a little inefficient. The motor is quiet, and while it says “Slow juicer,” it took more time to core and slice the apple, or peel and wedge the orange, than it did the for machine to juice the pieces. Overall, thus far I am very impressed. 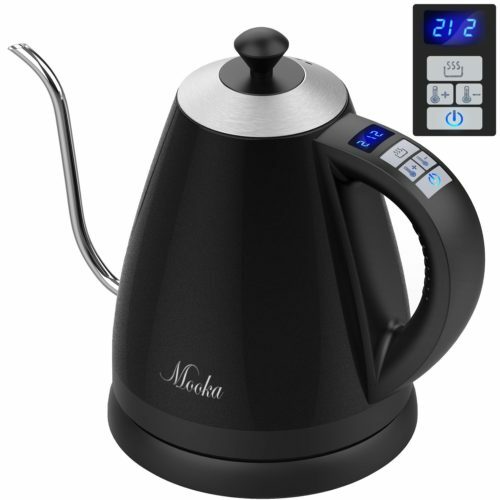 Very convenient, I use it for watermelon juice, easy to clean. but you need to cut the watermelon to small piece. Good Juicer, well built and very quiet. After some initial struggles, the unit is easy to use and clean. Great juicer. Slow enough for leafy greens and gets a lot of juice. Perfect for Joe Cross challenge. Easy clean up. Love this juicer. Up for fresh and tasty juice! Very nice juicer with sturdy components and smooth operation. easy to operate and i was able to get juice out of hard carrots very easily. Really hoping to use the product very often for fresh tasty juice.